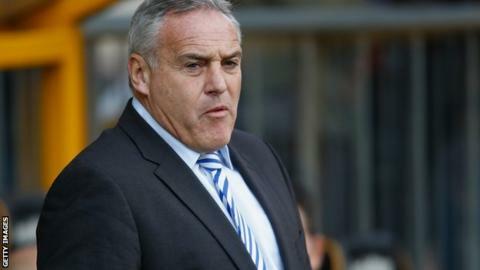 Sheffield Wednesday manager Dave Jones has urged his side to "stop conceding sloppy, lazy goals" after their seventh defeat in eight games. He was unhappy with the way his side allowed Hull to secure a 1-0 win at Hillsborough on Saturday. "We created our own problem by switching off for the goal. "It's those errors at this level that will cost you goals, we seem to keep making those errors," Jones told BBC Radio Sheffield. "If we leave that person out because he made the mistake, then we put someone else in, they seem to make it." The Owls find themselves in the Championship's relegation zone, having only been promoted to the Championship last season, but Jones believes his side have shown enough promise so far this campaign to give him hope. "Of course it's concerning but you have to look at the performance and not just the result sometimes. "This looked like a 0-0 all over, it's not like we are getting battered at this level," he added. "It's our errors that we are making. We've got a lot of possession and created some chances, in some areas we've lacked some quality - that's in the last third. "We've come up to a completely differently league, and it's not as if we aren't matching teams at this level." Meanwhile, Jones has also revealed that he wants to extend the loan stay of Everton midfielder Ross Barkley. The 18-year-old has made seven appearances for the Owls during his spell at Hillsborough, scoring one goal. "Hopefully we can keep him. I think they want us to have him because the kid hasn't done anything wrong," Jones said. "He's very instrumental in what we are trying to do, his passing and his movement was there."